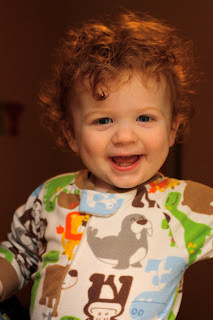 We are seriously loving this hair lately... it cracks us up- especially right after his bath or right after we use his "curl enhancing" product in the morning (it's the only way to keep his hair out of his face all day). what a cutie! LOVE his hair. and that smile...heart breaker.